Hope your week was amazing! Last week I freaked you out with some breathless fishes. This Friday I’ve found a live fish, but it’s about to fall off the table with his strange tank.. Or is it just an illusion? You can purchase this cool tank if you wish at Psalt Design.co.uk! But how about some real balancing “tricks”, that are no illusion? Can you try balancing a hammer like this? 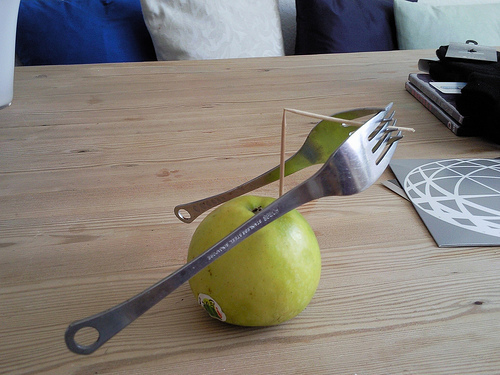 Apple and fork balancing trick exceptional example of the Lever Principle in action! Fourteen nails balanced on the head of one nail. Learn it how! Let me know what you think about this. Have you ever try to experiment with these kind of balancing challenges?